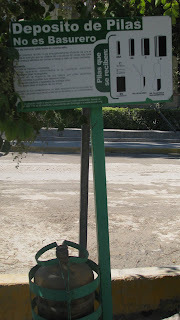 CUATRO CIENEGAS--In many small towns in Mexico you are not likely to find a very environmentally conscious community. Things like trash cans around town can be hard to find. Heck, even in the D.F., where 20 million people live, it can be hard to find a trash can when taking a stroll. So it was refreshing to see that having one of the 13 wonders of Mexico in your backyard does help motivate residents to act green. In the town's main plaza, there were several battery deposits like in this photo. The city has a campaign to collect the town's old, used batteries and dispose of them properly. People of the town are being taught that toxic chemicals in the batteries can leak into their the water when dumped in a landfill. The challenge has become trying to get companies who dispose of the batteries to travel to the small desert town to pick up small quantities of batteries. But every little bit helps.